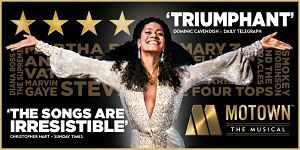 Motown the Musical will embark on a major UK and Ireland tour opening at the Birmingham New Alexandra Theatre on 11 October 2018 . Berry Gordy is the founder of Motown, the enterprise that nurtured the careers of legends including Smokey Robinson and The Miracles,​ Diana Ross and The Supremes, Stevie Wonder, The Temptations, The Four Tops, ​Michael Jackson and The Jackson 5. Gordy is also a songwriter, producer, director, boxer, innovative entrepreneur, teacher and visionary. Actively involved in the Civil Rights movement, he also released the recorded speeches of Dr. Martin Luther King, Jr. His films include Mahogany and Lady Sings the Blues, which received five Academy Award nominations. He has been inducted​ into the Rock and Roll Hall of Fame, received ​a star on Hollywood’s Walk of Fame, the Rhythm and Blues Foundation’s Lifetime Achievement Award, the Songwriter’s Hall of Fame Pioneer Award, the Grammy Salute To Industry Icon’s President’s Merit Award and was honoured by President Barack Obama with a Salute to Motown evening at the White House. Casting news so far is that Edward Baruwa (Motown, Les Miserables) will play the leading role of Berry Gordy, while Karis Anderson (member of pop band Stooshe) will play Diana Ross, Nathan Lewis (X-Factor finalist) is Smokey Robinson and Shak Gabbidon-Williams (The Lion King) will play Marvin Gaye. Ensemble members include Dayo Adeoye, Scott Armstrong, Simeon Beckett, Natalia Brown, Ethan Davis, Andrew Dillon, Akeem Ellis-Hyman, Christopher Gopaul, Daniel Haswell, Olivia Hibbert, Karis Jack, Michael Jeremiah, Amana Jones, Abz Kareem, Kane Matthews, DeeArna McClean, Matt Mills, Cordell Mosteller, Nicole Nyarambi, Spencer O'Brien, Perry O'Dea, Alex Okoampa, Reece Richards and Emma Robotham-Hunt. Below is the information we have so far with further dates to be announced soon.